Yes. One learns something every day. I spotted an ad on the subway this morning that, frankly, I thought was a joke on the order of the Saturday Night Live sketch for the Bassomatic and I took a picture so that I'd remember to go look it up. Doesn't that sound like a joke? It isn't! 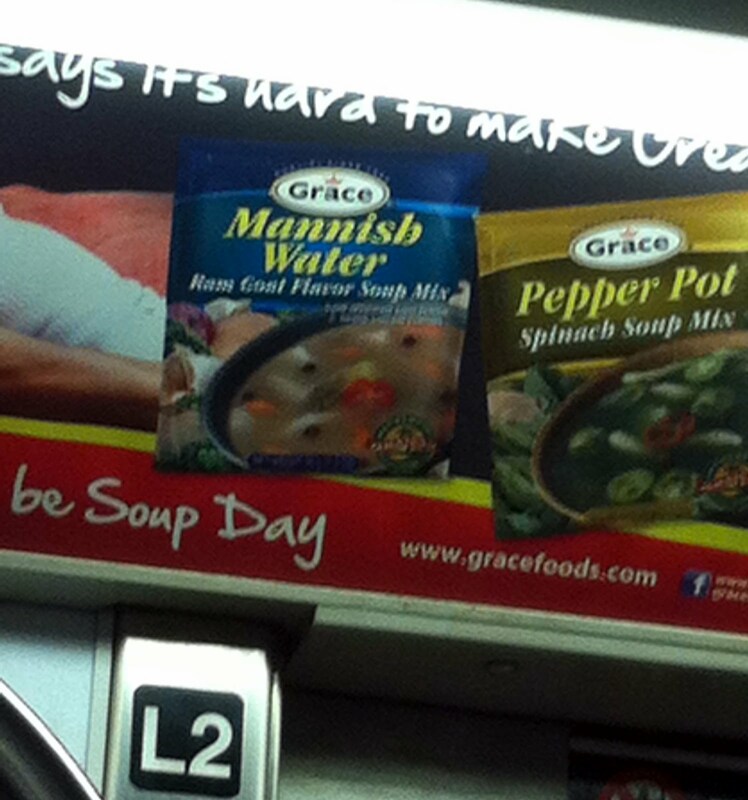 Mannish water turns out to be a spicy Jamaican goat soup, possibly an aphrodisiac, often served to the groom on his wedding night, at least according to Wikipedia. The manufacturer's website has a recipe if you want to make it yourself (though it requires 2 pounds of goat head and belly), but they also sell an instant soup, and the aforementioned soup mix. Back when I was in graduate school, I had a part time job in the back office of a big law firm. I had nothing to do with legal work; I helped with systems and office supplies and emergency planning and oversight of the cafeteria. That kind of thing. I rarely ate in the cafeteria, usually preferring an outside adventure, but one day I was in there and they were serving lamb curry for lunch. "Lamb curry", I said to the cook, "sounds good!" He leaned over and winked at me. "It's actually goat, but we don't want to tell the lawyers that." I may well have had a Drake's Coffee Cake out of the machine for lunch that day, but I loved that the cafeteria guys were pulling a fast one on the lawyers. On the other hand, now that I know about Mannish Water, maybe the cafeteria was trying to rev up the lawyers so that they'd have lots of billable hours and the firm would do well and everyone, including the cooks, would get raises. Whatever. I love New York City. Yow. Delightfully odd. We have frozen goat heads in our Portland supermarket — yes, it's come to that even in Maine. You are a woman after my own heart. I love the photos you take of things like this. I'm surprised that someone who likes lamb would be freaked out by goat! I am quite sure they do not sell this in Ottawa. You know, goat is quite tasty if cooked properly. Depending, I guess, on the goat. How funny that you posted this today, when I bought a package of locally made, locally-raised goat ravioli. I have never eaten goat. I had to buy it just to try it! We also got duck eggs, which I have also never tried, and locally-made (not locally raised!) coconut oil. That is absolutely the wonder of New York. I guess I grew up eating goat so it doesn't seem like a huge deal. Really? They were scared to eat goat? a firend of mine just got married in Jamaica (her husband's dad and other family live there) and she said they eat some pretty weird stuff, including goat. Me, I would have tried the goat curry. Why not? why is goat any weirder than chicken or cow or fish or lamb? So funny you should mention this! I spent a month in Jamaica and had a good friend tell me about mannish water and saw this ad a couple weeks ago too with my husband. He didn't know what it was but I told him and he didn't believe me. He's Nigerian-American and grew up on goat but still found the description of mannish water off-putting. Oh and about painted maypole's comment about goat being weird, the US is actually the weird one - most of the world eats goat (you can read more about it here: http://www.gadling.com/2011/10/10/got-goat-a-cultural-exploration-of-the-other-red-meat). Of all the days to be fresh out of goat head and belly!